Michigan State Football is one of my all-time favorite things, that&apos;s why I always get excited for the annual Green versus White inner-squad spring game. It&apos;s a taste of football after not having seen any in a few months and its a great look into what we can expect on the field this fall. What are you doing on Saturday? If you can make time to get to the game at 2 p.m. (free admission) I highly recommend you do it. In fact, coach Dantonio is calling out fans for the best attendance at a spring game ever, looking for attendance of 50,000. You know you want to be in that number. The game, Saturday, April 26 at 2 p.m. will be held, of course, in Spartan Stadium. Parking is free (in Lots 79, 62W, 67, 56, 39/40, 41; Ramps 2 and 5; Lot 62E has been reserved for disabled parking). 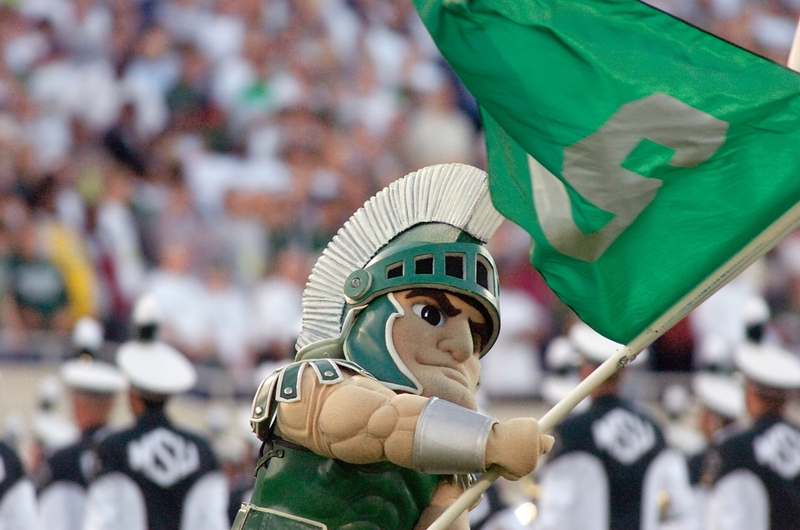 Admission is free, and the stadium gates (Gates A, B, C, D and G) open at 12:30 p.m.
Sparty will be at the Spring Football Green & White Game - Will you? Michigan State&apos;s 2013 team - which won a school-record 13 games, including the Big Ten Championship and 2014 Rose Bowl Games, and ranked No. 3 in the final polls - will be honored at halftime of the spring game. The first 30,000 fans will receive a commemorative poster, featuring infographics that highlight each of MSU&apos;s 13 victories as well as the team&apos;s top individual award winners from last season. Prior to the spring game, MSU&apos;s coaching staff and players will conduct a free youth football clinic, sponsored by Blue Cross Blue Shield of Michigan. Children, ages 8-12, are invited to attend the youth clinic (no registration required) from 10-11:30 a.m. on the grass practice fields behind the Duffy Daugherty Football Building, located at the corner of Chestnut Road and Shaw Lane. Clinic participants and their parents are requested to enter the practice fields through the gate on Shaw Lane. Over the last 11 years, nearly 6,200 children have participated in the annual youth football clinic. The purpose of the clinic is to introduce youngsters to the game by stressing fundamentals. No football gear is required. In addition, clinic participants will receive Country Fresh ice cream as well as a coupon for a complimentary hot dog and soft drink to be redeemed at a concession stand in Spartan Stadium during the spring game. For the seventh year in a row, fans will have an opportunity to purchase press box seats and enjoy the same view as the media that cover Spartan football. Only 100 press box seats - priced at $75 each - are on sale for the spring game. (Note: Minimum age requirement is 12 for press box admission.) Proceeds from the sale of press box seats will benefit the George Webster Scholarship Fund. Fans may order press box seats online at msuspartans.com. Click here to order your press box seats online. The deadline to order press box seats is 12 p.m. Friday, April 25. See you there! Go Green and Go White!